Advantages: Well known subjects and pilots, decals include stencil set and 0-9 numbers to create your own interpretation of BuNos. Conclusion: With the ongoing popularity of the big scale Corsairs, this set will really enhance the finish of any Corsair. The subjects are interesting and well known. Eagle Editions have one again produced an outstanding set of decals. Highly recommended. 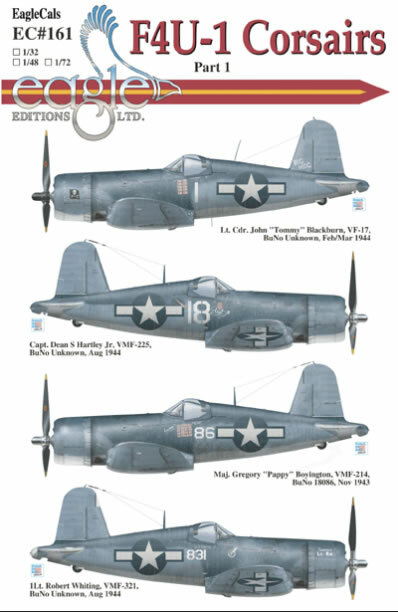 This decal set of famous F4U-1 Corsairs appears to be of exceptional quality. The colours are well interpreted, the print quality very good, with minimal carrier film. One thing which I like are the several options for font size, or BuNo options, where there doesn’t appear to be hard evidence for the correct option. The instructions give a small history on each aircraft, which is a nice touch. This set includes stencils, and Hamilton Standard propeller decals are also included. National insignia are enough to complete 1 aircraft. With the ongoing popularity of the big scale Corsairs, this set will really enhance the finish of any Corsair. The subjects are interesting and well known. Eagle Editions have one again produced an outstanding set of decals.